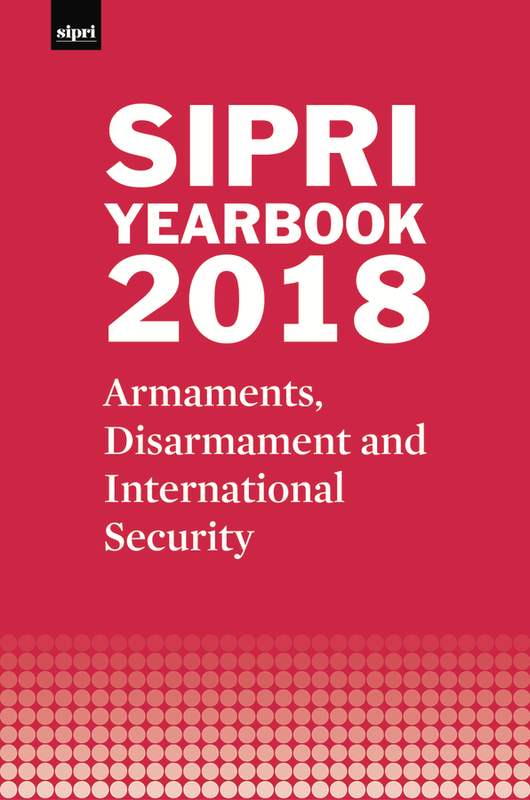 Translated summaries of SIPRI Yearbook 2018 are now available in five languages. The 49th edition of the Yearbook—a compendium of data and analysis on developments in armaments, disarmament and international security—was released in June and is available in print and online from Oxford University Press (OUP). 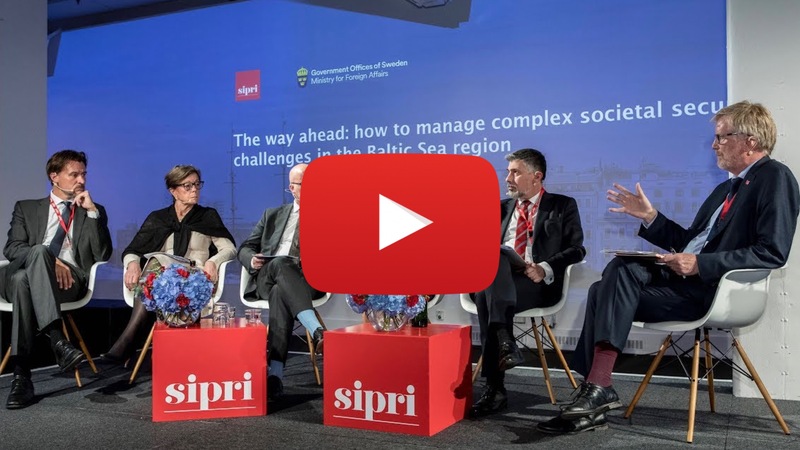 In June, SIPRI co-hosted a conference with the Swedish Ministry for Foreign Affiars to address societal security challenges faced by states in the Baltic Sea region. SIPRI interviewed a range of represenatives from the region about their views on the biggest societal security challenges; what they would like to see happening; and examples of ongoing cooperation. 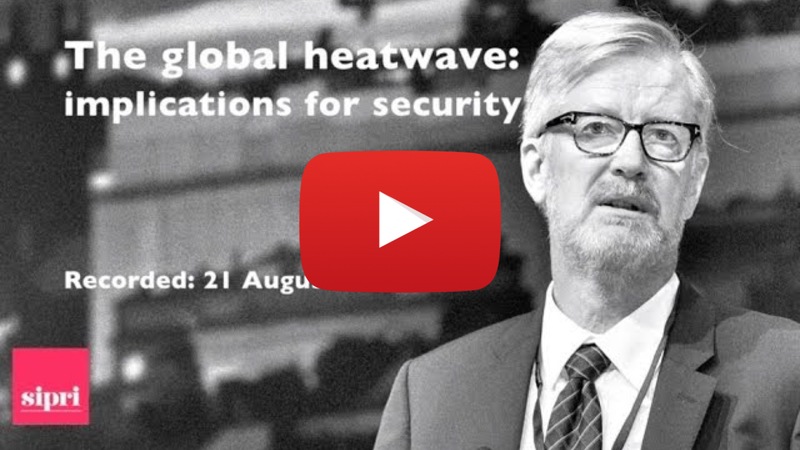 These short films are part of the SIPRI Spotlight series. SIPRI is hosting the Expert Working Group on Climate-related Security Risks, initiated during Sweden’s membership to the United Nations Security Council (2017–18). The group aims to produce policy-relevant assesments of climate-related security risks that can strengthen the UN's decision making and programming on those risks. The first report on the Lake Chad Region has been published, and the second report on Iraq is due out 30 August. Following a new Council Decision further extending EU support for the project, the EU Non-Proliferation and Disarmament Consortium enters a new phase with widened objectives, including an explicit focus on disarmament. The consortium now also includes two new organizations: the International Affairs Institute in Rome (IAI) and the Vienna Center for Disarmament and Non-Proliferation (VCDNP). SIPRI is pleased to announce Sigrún Rawet as new Deputy Director of the Institute. She will assume the post on 10 September 2018. In the latest commentary from SIPRI’s Sahel and West Africa Programme, the authors outline the recent Mali presidential elections and provide an overview of SIPRI’s post-election survey that has been undertaken to better understand the expectations of Mali’s population. SIPRI’s Kolja Brockmann shines a light on an often overlooked aspect in the debate about 3D-printable guns: the role and importance of export controls on the transfer and sharing of technical data. The Arms Trade Treaty Fourth Conference of States Parties took place in Tokyo on 20–24 August. Mark Bromley reflects on the challenges facing the Arms Trade Treaty and how states can collectively deal with these. Record-breaking temperatures have been experienced in many parts of the world in recent months. ‘Is this the new normal?’ What are the security implications? ‘What can be done?’ Dan Smith shares his thoughts in Peace Points. SIPRI will co-host an event at World Water Week (27–31 August), ‘Political drivers for sustainable ecosystems: Sustaining peace’, featuring SIPRI chair Ambassador Jan Eliasson and director Dan Smith. The session (14:00–15:30) will also be livestreamed. Alongside this, SIPRI will co-launch—together with three other Stockholm-based research institutes active in the climate-security field—the Stockholm Climate Security Hub, a cross-institutional knowledge platform supported by the Swedish Ministry for Foreign Affairs. For onsite interview requests, please contact Alexandra Manolache, SIPRI Communications Officer (alexandra.manolache@sipri.org, +46 76 628 61 33). To mark the launch of a new report on the 21st Century Maritime Silk Road, SIPRI will hold an event in Stockholm to consider security implications and cooperation prospects on international and regional levels. Among others things, the event will consider the specific implications of the initiative for Sweden. Additional events to discuss the report will take place in Beijing, Berlin and Brussels in the coming months. The 2018 Stockholm Security Conference, organized in partnership with the Riksdag and the Munich Security Conference, will focus on the theme ‘Emerging technologies: Unseen connections, missing players, absent solutions’. The conference will connect analysis of emerging technologies with discussions surrounding responses—the desirability and feasibility of international norms and the appropriateness of arms control frameworks. This event is by invitation only. SIPRI participated in a range of activites at 2018 Almedalen Week in Visby, Gotland. The events ranged from discussion on topics of nuclear non-proliferation and disarmament to the exploration of the links between climate change, conflict and hunger. The Swedish Government has formally appointed Jean-Marie Guéhenno and Dr Patricia Lewis as new members of the SIPRI Governing Board. SIPRI welcomes Luc van de Goor as Director of Studies for programming in conflict and peace. He is the outgoing Director of Research at the Clingendael Institute in the Netherlands. The transnational character of climate-related security risks often goes beyond the capacity of national governments to respond adequately. As such, it creates challenges for and increases the relevance of intergovernmental organizations (IGOs). This SIPRI Insights presents a concise analysis of four regional IGOs—two in Asia and two in Africa. The main findings show that, in various ways, climate-related security risks have found their way into the IGOs’ policy frameworks and institutional discourse.